CER elementary promotes meaningful development of the competences, knowledges, processes, and skills needed for life. We work on habits and positive attitudes in our students, encouraging the active and responsible participation of students in different educative experiences. Elementary gives to CER students a secure and neat learning space; with the possibility of expanding their horizons and working autonomously and independently in the world around them. CER elementary promotes meaningful development of the competences, knowledges, processes, and skills needed for life. We work on habits and positive attitudes in our students, encouraging the active and responsible participation of students in different educative experiences. Elementary gives to CER students a secure and neat learning space; with the possibility of expanding their horizons and working autonomously and independently in the world around them. In CER elementary we can see in our students a citizen with the power to transform their society, that’s why we give them a personalized attention and education through a professional team properly prepared that, work close with the families, teachers and educative community. We are backed by AMCO methodology which promotes multiple intelligences development and critical thinking, encourages cooperative learning in every student and the acquisition of English language through the “generating voice”, which encourages student to comprehend the second language and correctly use it in daily life. Our bilingual system’s goal is that our students get a multi-task profile, in other words, the total manifestation of their potentialities through the multiple intelligences stimulation, emotional intelligence and the management of English language as a communicative vehicle in a global world. Elementary CER gives our students learning tools that go further than the academic content. We promote technological, familiar, group and experimental activities, which allow them to get meaningful and lasted learnings. For CER the family participation in our students’ education is very important, that’s why teachers, parents and students work everyday in the learning conformation. We make the comprehension and the practice of human values part of the scholar life, forming in that way, the foundations for a future healthy and happy life since the early childhood. 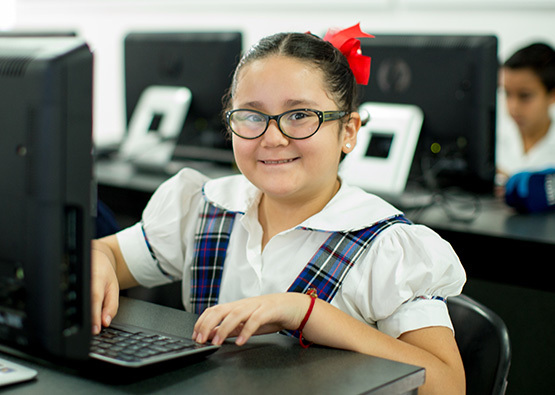 In CER we promote the integral development of our students through computer, art and physical education classes. We complement classroom learnings with research, sport, cultural, art, social and recreational activities through the scholar year. Some of our activities are described then. Our human development program wants to get in the student a truly and a real self concept towards to a healthy self stem. CER student, acquires and make their abilities stronger through this program which helps them to be part of a social group and also helps them to get the best resources for the correct management of their emotions and the anger, they learn to face natural frustration with strength, to look up for solutions to their conflicts with classmates and to develop a cooperative and functional work. Our elementary has a Psychology section which is in charge of the guiding and caring of our students’ behavioral, emotional and social development, working closely with the families and external professional needed. Elementary students go to supervised trips where they have the opportunity to practice the acquired knowledge in classrooms. Besides, these trips give students meaningful experiences which make them have lasted learnings. Once a year, our students invite their parents to observe and participate in an English class with them. Parents can observe a piece of an English class that our students take everyday in our bilingual system and at the same time they can participate in a meaningful and funny way. We complement education with scientific and cultural fairs which promotes in our students the interest and like for science, culture, art and ecology. We are a committed school in environmental education and our planet caring.